Millard A. Johnson – JDKG – Johnson DeLuca Kurisky & Gould, P.C. 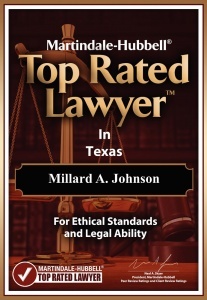 A native of Texas, Millard has been practicing law for almost 35 years. While the focus of his practice is commercial litigation, he has recognized expertise in land use and commercial real estate litigation, insurance coverage disputes, and complex payment systems litigation. However, there is no type of civil litigation matter Millard hasn’t handled successfully. He has experience is First Amendment cases, pipe and pipeline disputes, condemnation matters on behalf of both condemnor and condemnee, probate litigation, administrative and regulatory agency claims, and even criminal and divorce proceedings. He has also represented large banks and financial services companies in a wide variety of litigation matters. 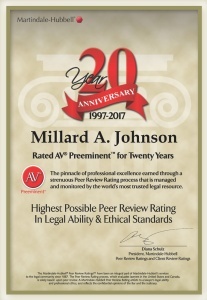 Millard is recognized for his knowledge of the complex, inter-linked moving parts that make up the landscape of legal disputes. 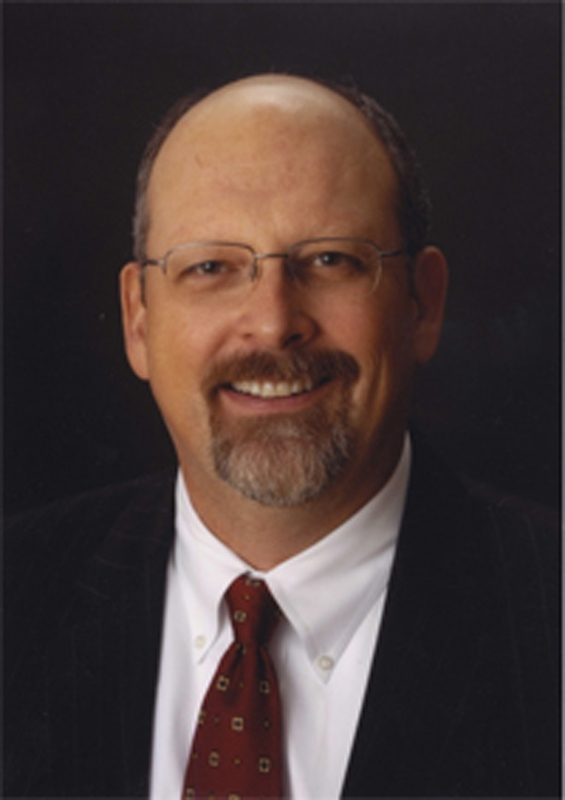 He understands how to expedite cases through a gauntlet of federal and state statutes and local municipal ordinances and regulatory schemes, government elected or appointed officials’ agendas, and within the confines of the overall political environment to achieve the best outcome for his clients. He is routinely sought out by other attorneys, both inside and outside of the firm, for his counsel on all types of cases. In fact, a substantial portion of Millard’s practice is in the representation of other attorneys who seek his assistance. 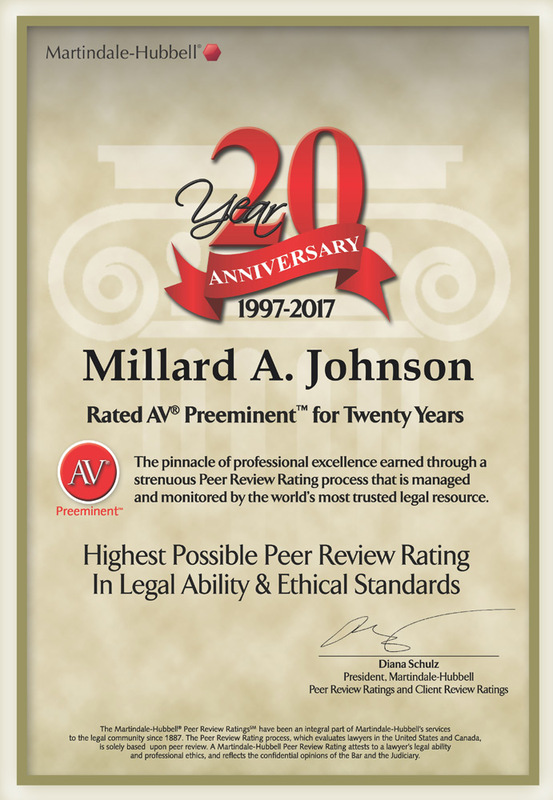 Millard’s substantial jury trial experience provides him with a major advantage in litigation, as well as to help his clients proactively avoid litigation. With an outstanding record, including numerous successful jury trials, Millard is a recognized face in the broader Houston area’s courthouses. He is well respected as an attorney who maintains productive professional relationships with many of the judges, and comes to court well prepared with solid, defendable arguments. 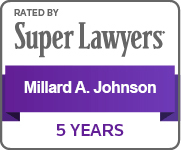 Millard has been named one of Texas’ Super Lawyers® by Key Professional Media, as published in Texas Monthly magazine on more than five occasions – most recently in 2017. 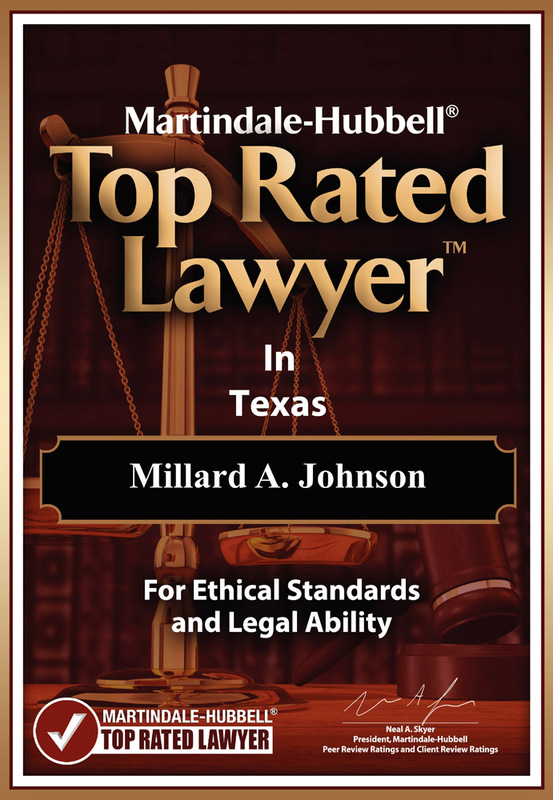 He was selected based upon stringent nomination criteria and a rigorous vetting process, placing him in the top 5% of lawyers in the state of Texas. He has been AV rated for more than 20 years by Martindale-Hubbell. – Successfully tried to a jury verdict a multi-million dollar dispute between the operator of the iconic Flagship Hotel against Landry’s, Inc.
* No. 90-1844; In the Supreme Court of the United States, October Term, 1991; Prudential Insurance Company of America, Petitioner, v. Billy W. Brown, Respondent. * Case No. 02-40994; In the United States Court of Appeals for the Fifth Circuit; In the Matter of: Bristol Resources 1994 Acquisition Limited Partnership; Bristol Resources Corporation; Bristol Production Corporation, L.L.C., Stephen E. Jackson, et al., Appellants, v. Nifuel Company, Inc. formerly known as Nipsco Fuel Company, Inc.; On Appeal from the United States District Court, Southern District of Texas, Corpus Christi Division. * No 93-2842; In the United States Court of Appeals for the Fifth Circuit; the Houston Business Journal, Inc. and Dee Gill v. The Office of the Comptroller of the Currency. * No. 91-6288; No. 91-6141; In the United States Court of Appeals for the Fifth Circuit; Transamerica Occidental Life Insurance Company v. Jimmy W. Grider; On Appeal from the United States District Court for the Southern District of Texas, Houston Division. * In the United States Court of Appeals for the Fifth Circuit, No. CV-87-6111; Texas Gulf Trust Company v. Natural Gas Pipeline Company of America; On Appeal from the United States District Court for the Southern District of Texas. * No. 07-0231; In the Supreme Court of Texas; Tesoro Petroleum Companies, Inc., Tesoro Marine Services, Inc., and Coastwide Marine Services, Inc. v. Four Brothers Boat Works, Inc., Columbia Star, Inc. and Billy B, Inc.; On petition from the Court of Appeals for the Fourteenth District of Texas, Houston, Texas. * No. 95-0772; In the Supreme Court of Texas; Marist College v. William Nicklin and Alex, Brown & Sons, Incorporated; On Appeal from the First Court of Appeals, No. 01-94-0849-CV and From the 234th Judicial District Court of Harris County, Texas, Cause No. 93-08661. * Cause No. 94-1201; In the Supreme Court for the State of Texas; California Insurance Guarantee Association and Wisconsin Insurance Security Fund v. Honorable James W. Mehaffy. * No. 06-08-00018-CV; In the Sixth Court of Appeals at Texarkana; Wendell Watson v. TeleCheck Services, Inc. and TRS Recovery Services, Inc.; Appealed from the 123rd Judicial District Court of Panola County, Texas. * No. 14-07-00290-CV; In the Court of Appeals, Fourteenth District of Texas at Houston; F. Alan “Bud” Frick, Butler & Cook, Inc. d/b/a Butler and Cook, Inc. et al. v. Total Separation Solutions, LLC; On Appeal from the 215th Judicial District Court of Harris County, Texas. * No. 01-01-00631-CV; In the Court of Appeals for the First Judicial District at Houston, Texas; City of Hedwig Village Planning and Zoning Commission and S. Frank White v. Howeth Investments, Inc. and Jack Howeth as Trustee for the 881 Brogden Trust and the 901 Brogden Trust, Assignees of Howeth Investments, Inc.; On Appeal from the 189th Judicial District Court, Harris County, Texas. * No. 01-86-00216-CV; In the Court of Appeals for the First Supreme Judicial District of Texas; Texaco Inc. vs. Pennzoil Company; On Appeal from the 151st District Court of Harris County, Texas.